The site of Quest Brewing. Thomas Creek and Blueridge Brewing have been the only kids in Greenville’s beer family for the past 15 years. Those teenagers are about to get a baby brother. Don Richardson and Andrew Watts are set to give birth to Quest Brewing Company. Starting with the arrival of The Community Tap in 2010, Greenville has been on a trajectory with an increase of craft beer coming to Upstate South Carolina. Since they opened, the area has seen five additional craft beer stores open. Total Wine, Green’s and Whole Foods have also installed growler filling stations to keep up with the times. While the retail side of craft beer has been booming, the production end has remained in stasis… until now. Aiming for a launch in late-May 2013, Don and Andrew aren’t a couple of newbies who got loose with a homebrew kit and thought it would be cool to start a brewery, although I’m hoping that business model works for me someday. Don has a couple decades of experience in the beer world, and Andrew has been a successful businessman in IT. Quest Brewing founders Don Richardson (left) and Andrew Watts in front of the soon-to-be brewhouse, sans kettle. Don has worked both on the production and distribution sides of the industry. He was a brewmaster at Boulder Beer Company in Colorado and at Cottonwood Brewery in North Carolina. He also owned a distribution business in Greenville, All Good Brands, for 10 years that specialized in bringing Belgian beer stateside. Andrew is going to run the business side while Don handles the beer. Andrew’s journey to found Quest is bitter-sweet. A few years ago, his brother Sean passed away at an entirely too early age. Sean was a huge craft beer fanatic and made a convert of Andrew. To honor his brother, Andrew decided he wanted to start a brewery. Don and Andrew were introduced through Ed Buffington, one of the co-owners of the Community Tap. They met for a beer or three at Barley’s Tap Room one evening and immediately hit it off. 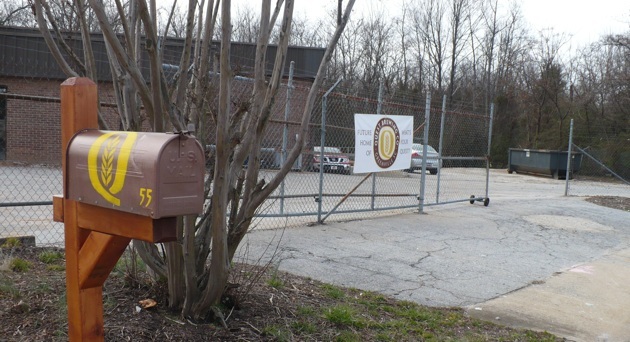 They realized they shared a common vision to start a brewery in Greenville. Thus, Quest was conceived. 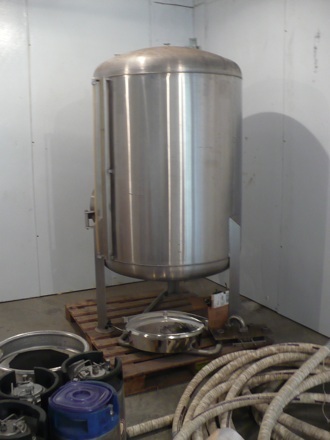 The 10-barrel fermenter, which will some day hold many delicious sour beers. 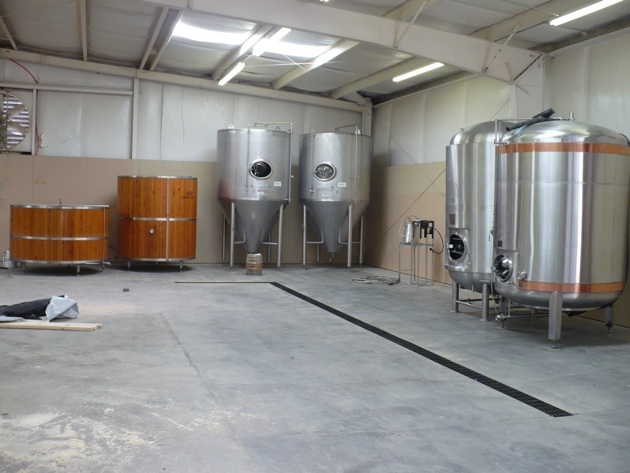 While the brewery construction is currently in-process, most of the major work has been done. Quest has been assembled “Frankenbrewrey” style. They have pieced the brewery together from equipment acquired from seven breweries in the Southeast: Olde Mecklenburg, Aviator, New South, Craggie, Big Boss, Lone Rider and Terrapin. Quest is coming out of the gates with a 25-barrel brewhouse, two 25-barrel fermenters, two 40-barrel fermenters and one very special little 10-barrel fermenter. The little guy is going to house the sour project beers. Yes, Quest is going to make sours! Their initial offering is going to start with four year-round beers: Golden Fleece Belgian Pale Ale, Ellida IPA, Smoking Mirror Smoked Porter and Kaldi Imperial Coffee Stout. The brewery is also going to have a barrel room to barrel-age some special one-off brews. I’ve gotten to know Don over the last couple years, I know he has a great mind for beer and knows what to do with a hop pellet. He was one of the creative forces behind the recipe of the Community Tap’s Trifecta IPA, which is one of my favorite hop-forward, smooth drinking IPAs. Word on the street is that Ellida IPA stole the show at Barley’s Biggest Little Beer Fest in January. I can’t wait to see what he does with full creative license over his own brewery. Stay tuned, Greenville. The beer family station wagon is about to add a car seat, and there’s still plenty of room in the back. The ride is about to get wild. This entry was posted in Beer spots, Breweries and tagged Community Tap, Ellida IPA, Greenville, Quest Brewing, thomas creek, Trifecta IPA. Bookmark the permalink.